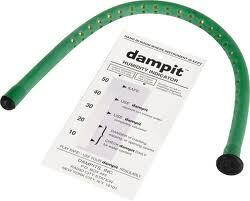 The Original Dampit Humidifier, superior soft rubber sleeve encloses a special open cell sponge. Simply soak in water, wipe off, and place inside F hole of instrument. Instructions and handy humidity gauge included. The Dampit humidifier provides long term humidity protection, guarding against cracking and warping.